So about two months ago while perusing in the cookbook section of my local Barnes & Noble I began scanning through some of their slow cooker cookbooks and settled on purchasing America’s Test Kitchen: Slow Cooker Revolution. I was excited to try out some of the recipes as they sounded really good. I started with the Loaded Baked Potato Soup and it was a disaster! It had no flavor and was more like heavy mashed potatoes instead of soup. I decided that I would try it again another day with less potatoes. But then I tried another recipe and it didn’t come out that great, okay, truthfully, it was horrible again. It was a Broccoli and Chicken sauce that was to be used for pasta. The sauce, made with chicken broth and wine as the base, was bitter and the chicken was dry. Yuck! So, instead of trying a third recipe – quite honestly at this point none of the recipes sounded all that great – I headed back to Barnes & Noble to see if I could return it. And luckily I was able to. And since I wasn’t in a rush, I headed back to the cookbook area and picked up another book to try out… Slow Cooker Family Favorites by Maggie Shi. 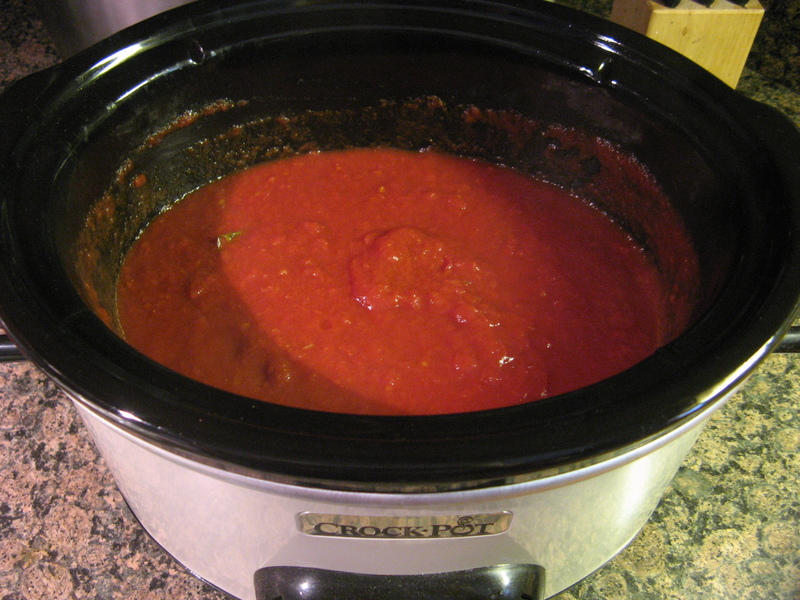 And (oh boy, starting 3 sentences in a row with “and,” such bad grammar… LOL) the first recipe I tried was delish… a slow cooker marinara sauce. To make the sauce I combined crushed tomatoes, olive oil, tomato paste, red wine vinegar, fresh basil, fresh garlic and salt in the bowl of my slow cooker. And then gave everything a few good stirs and set it to cook on low for seven hours. For a little extra seasoning I added a few grinds of fresh pepper and that was it. I ended up with about 6 cups of sauce. 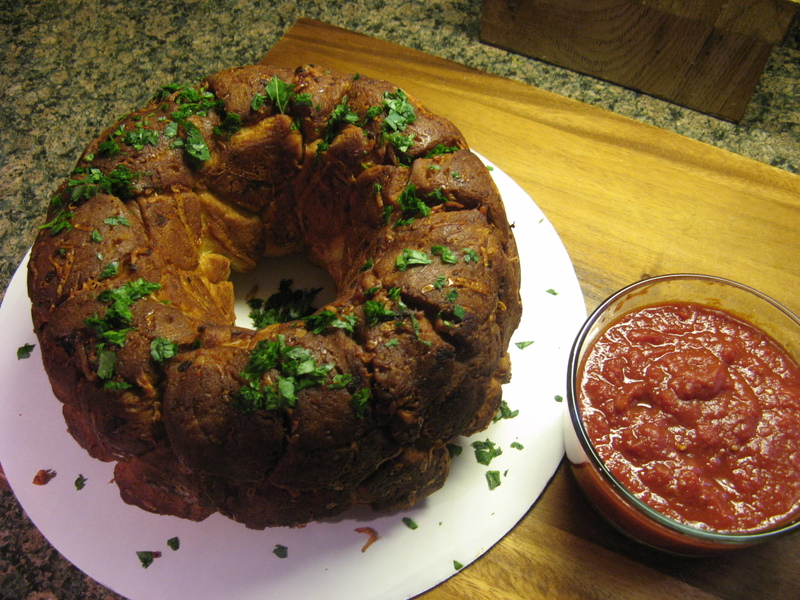 I decided to freeze 4 cups and used 2 cups as a dipping sauce for this Cheesy Garlic Monkey Bread that I will be posting about tomorrow! 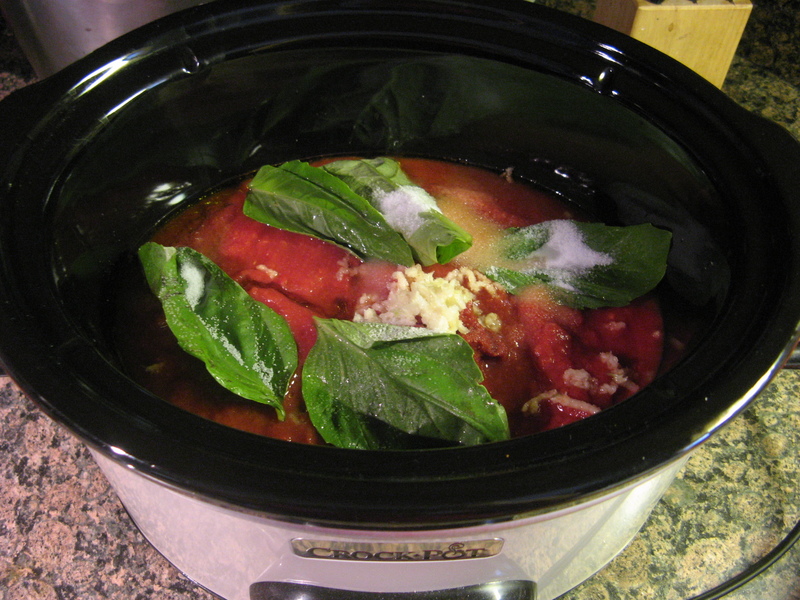 Add all the ingredients to the bowl of a slow cooker and stir together. Cover and cook on low for 7 hours. Taste for seasoning. Serve with breadsticks, garlic bread, baguette slices, etc. for dipping. Or use for your favorite pasta. Makes about 6 cups.